Caterham's administrator says the team needs to raise money to race in the Abu Dhabi Grand Prix and convince potential investors to take it over. A crowd-funding project has raised more than £1m of the £2.35m required to take part in the final race on 23 November. Administrator Finbarr O'Connell said: "The team needs to showcase itself. It needs to be acquired by some high-value individual, individuals or corporation. "But the only way they will acquire it is if the team is still together." 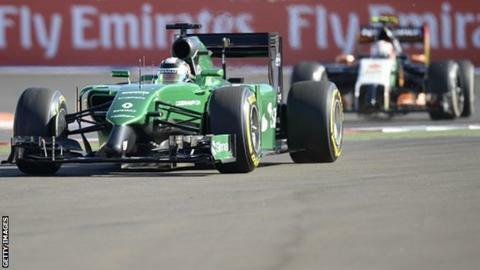 Caterham missed last weekend's United States Grand Prix and this weekend's Brazilian Grand Prix in Sao Paulo as the administrators attempt to restructure it. O'Connell added: "Abu Dhabi is the last link, the stepping stone for one of the purchasers I'm speaking to, perhaps the Middle Eastern purchaser I'm speaking to, perhaps one of the others, to sign that cheque and take it over. It is the best way to showcase it." Crowd-funding is a way of asking people to invest money in businesses or projects. More than nine million investments and donations were made last year. Asked why the potential purchaser would not buy the team first, he said: "Because it has not raced, because there is a concern about what they are taking on, about the team and the commitment of the team. "It is all very well to talk about really wealthy people doing things, but this is about 200 people giving their time and energy in order to make this work. the employees are the engine of this team." F1 boss Bernie Ecclestone has described the crowd-funding exercise as "a disaster", saying: "We don't want begging bowls. If people can't afford to be in Formula 1, they have to find something else to do." O'Connell said he was "really upset" about Ecclestone's remarks. Saying he was speaking to "more than two" drivers about racing in Abu Dhabi, he added: "We have planned all of this. "With the money we get from drivers with sponsorship and with huge support from a lot of other people, like (engine supplier) Renault, all our major counter-parties, are incredibly keen we are there, we survive, get through this new process, get a new backer and proceed as a properly functioning sound team." Asked why the crowd-funding money would not need to be paid to the team's creditors, he said: "The money is being raised for a particular reason, so the team can race in Abu Dhabi. "If it is not raised, it all goes back to the people who paid the money. The creditors are due their money from the assets of the company. If this team was taken over there will be much more money to go to the creditors of the company."